It’s the middle of May. THE MIDDLE OF MAY! That gives us just over two weeks to finish our pre-writing (if we are the pre-writing sort), stock up on our favorite snacks, and enjoy a lazy evening or two before all our spare moments are full of words. To make the preparations even better we are having another giveaway! Before you go check out the awesome prizes I want to remind you that there is still time to join the blog hop. It’s a great way to spread the word about JuNoWriMo and earn more entries for the giveaway. You can copy and paste what you need to from this post, create your own unique post, or do a combo of the two. If you choose to write your own, have fun with it! Share a little bit about what you will be working on this June, talk about your favorite part of JuNoWriMo, share your favorite recipe for a late night snack on those nights when you need to stay up and write all the words, the sky is the limit. The only must is please include a link to the JuNoWriMo website. 2. Join the linky list. Once your post is live, join the linky list. That way everyone else participating can visit and help promote your post. Visit a few of the other participant’s blogs. It’s a great way to meet some of the other writers before the event. First prize – writer care package including chocolate, coffee, assorted teas, and a JuNoWriMo mug. Cute, right? Perfect for long writing sessions! Second prize – JuNoWriMo swag pack including a JuNoWriMo button, JuNoWriMo sticker, and a hand-painted JuNoWriMo bookmark. These buttons are a great way to show what you’re doing this June. What’s more fun than a sticker? Especially an adorable, writing robot sticker? Now you can show your JuNoWriMo spirit even while relaxing with a book! What is JuNoWriMo? It’s your opportunity to write 50,000 words in 30 days, whether it be a novel, a non-fiction work, or a handful of short stories. Whatever your project is, we’re here to help you make it happen. We’ll challenge you with word sprints and dares, we’ll inspire you with pep talks, and – most importantly – we’ll be your support system when the writing gets rocky. The JuNoWriMo community is awesome when it comes to encouraging each other for success. There’s a closeness here you won’t find in other writing challenges. Jump in our forums for a brainstorming session, to hash out a story issue, or to simply connect with other writers. Win badges you can display on your Facebook page at each word count milestone. The point is, if you have something you want to write “someday,” write it with us in June! There will be three winners for this giveaway. The first prize is a writer care package full of awesome goodies such as: chocolate, tea, pencils, pens, sticky notes, notebooks, finger-less mittens, a hand-painted JuNoWriMo bookmark, and more! A big shout out to JuNoWriMo crew members Angi Black and Vicki Trask for donating to this awesome care package! Our second prize is a helpful tool for preparing for JuNoWriMo. Alicia Wallace at Word Wielder is giving away an hour-long novel prep session to one lucky winner. What better way to get ready to write that book? Our final prize is a JuNoWriMo t-shirt in style and color of your choice. There are many great options to choose from like this year’s new rocket ship logo. Check out all of our options here. More than anything, we want you to tell other people about JuNoWriMo, so you get BONUS giveaway entries for a couple of things. First, write a blog post to gain 5 bonus entries. What are you waiting for? Sign up now, then enter the giveaway! Don’t forget to tell all your friends so they can join us, too! There will be three winners for this giveaway. The first prize is a writer care package full of awesome goodies such as: chocolate, tea, pencils, pens, sticky notes, notebooks, finger-less mittens, a hand-painted JuNoWriMo bookmark, and more! A big shout out to JuNoWriMo crew members Angi Black and Vicki Trask for donating this awesome care package! Our second prize is a JuNoWriMo coffee mug. Keep your beverage of choice at hand as you write your way through June – this mug is the perfect companion. The final prize in our giveaway is a helpful tool for preparing for JuNoWriMo. Alicia Wallace at Word Wielder is giving away an hour-long novel prep session to one lucky winner. What better way to get ready to write that book? Second, print out this flier and post it locally at coffee shops, libraries, bookstores, or anywhere you have permission. Take a picture so we can see where you posted the flier, and you get another 5 bonus entries (you’ll post this image online, either on a public Facebook page/Pinterest/Instagram/Flickr or on your blog – just somewhere we can view it publicly). ***Note: photo must be clear enough to show us both the interior of the location AND the posted flier (not just a close-up image of the flier) to be a valid entry. Another way to get bonus entries is to donate to JuNoWriMo. Any donation made in 2014 (minimum $10) gets you 5 bonus entries! Sign Up for #JuNoWriMo 2014 and Enter to Win Prizes! Guess what – it’s April! That means there’s only two months until June. And what happens in June? JuNoWriMo, of course! The point is, if you have something you want to write “someday,” write it with us – in June! Our theme this year is Ludicrous Speed Ahead, because that’s how we want you to go at it. Jump into your book and write the whole darn thing in a month. Sound difficult? You can do it! We’re hosting a series of giveaways for anyone who registers for JuNoWriMo 2014. If you’ve done JuNoWriMo in the past, you’re eligible, too. Just log in to your profile and update your status to show us you’re in for another year. The first giveaway begins NOW! What can you win? We’re giving away a writer care package that includes: a notebook, tea, a shot glass, pens, art cards, a keychain, and more. A big shout out to JuNoWriMo crew member Alicia Wallace for donating this awesome care package! Our next prizes are generously donated by Angela Ackerman and Becca Puglisi from Writers Helping Writers. They are giving away two copies of either of their books (winner’s choice), The Positive Trait Thesaurus and The Negative Trait Thesaurus, two excellent writing tools for figuring out your pesky characters before June. 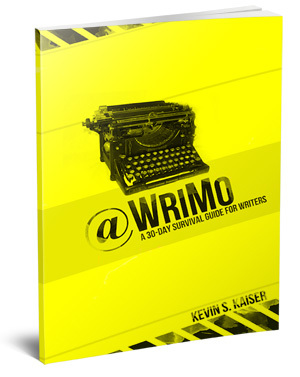 The final prize in our giveaway is another helpful tool for preparing for JuNoWriMo. Alicia Wallace at Word Wielder is giving away an hour-long novel prep session to one lucky winner.